A graduate of the University of California, Berkeley’s Boalt Hall School of Law, he has been an attorney since 1993 and maintains the blog at Valuation Education. LIA has been offering E&0 insurance and loss prevention information to the appraisal profession nationally since 1972. The FDIC’s negligence claims in the lawsuit stem from two appraisals of a single family residence in Grand Junction, Colorado. The FDIC filed the case as the receiver for failed lender Amtrust Bank. In January 2008, defendant appraiser Broom prepared an appraisal of the home for a proposed cash-out refinance being arranged by Clarion Mortgage and funded by Amtrust. He appraised the property for $1,900,000. The underwriting rules for a large-cash out loan required that Clarion obtain two appraisals and, thus, according to the FDIC, Clarion obtained a second appraisal from defendant appraiser Pace. He also appraised the property for $1,900,000 according to the FDIC. The FDIC suggests in its complaint that the second appraiser was given the first appraisal and asked to reach the same value conclusion. The FDIC alleges that the “two appraisals were not independent valuations of the Property” and that both appraisers erred by overstating the square footage of the home by counting a “detached theater room as part of the main dwelling’s living area.” The FDIC alleges both appraisals misstated the “gross living area was 5,053 square feet, when it was actually 4,523 square feet.” What’s not clear from the FDIC’s vaguely written complaint is whether the second appraisal was really a review that merely concurred with the first appraisal or whether it truly was an entirely separate non-review assignment. The FDIC has misleadingly pleaded other complaints with regard to this issue. 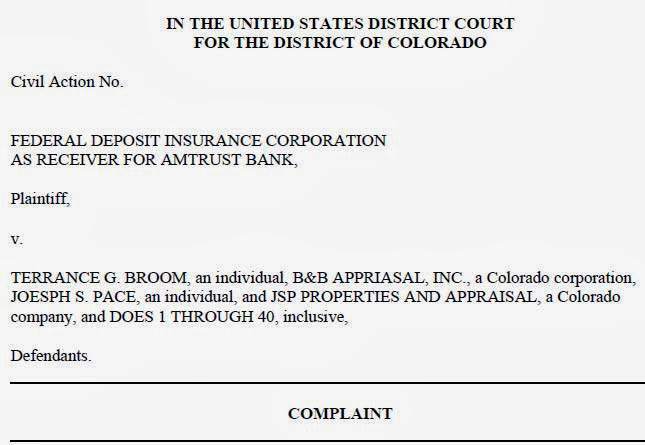 In its complaint, the FDIC alleges that, based on the two appraisals, Amtrust funded a $1,025,000 loan to the borrowers, who received $403,000 cash-out at closing. According to the FDIC, Amtrust would never have funded the loan at all if the property had been properly valued by the appraisers (the FDIC does not allege what the correct valuation should have been) and, thus, the appraisers are liable for “damages . . . in an amount to be proven at trial, plus interest, costs, and attorneys’ fees.” In other cases, the FDIC has contended that such damages should include: the entire unpaid loan balance, all accrued interest, all accrued late charges and all costs associated with foreclosure handling. The appraisers apparently are being defended in the case by their appraiser E&O provider; not all policies cover FDIC claims as explained here. 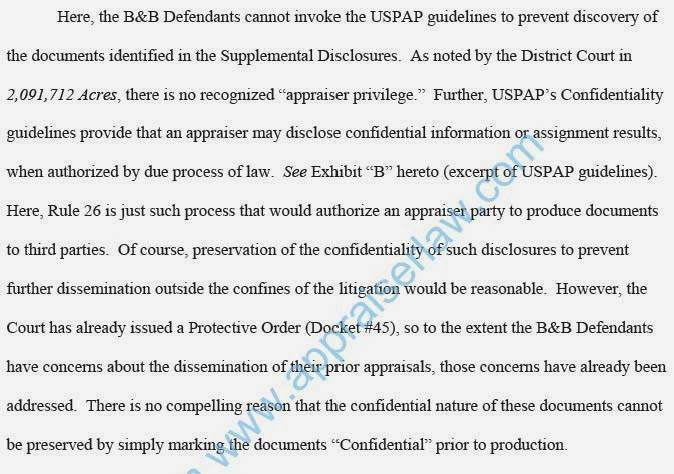 In opposition, the defendant appraiser tried to argue that USPAP nevertheless did prohibit him from disclosing the other appraisals for other clients and that disclosure would also somehow prejudice the outside parties for whom the other appraisals were produced. The appraiser pointed to a 1974 (pre-USPAP) case U.S. v. 25.02 Acres of Land in which disclosure of appraisal work relating to nearby land by an appraisal expert witness in a condemnation case had been denied on the basis of prejudice to the other clients of the appraiser — the court believed production would have prejudiced the other landowners because of on-going condemnation litigation. The court’s ruling is consistent with how another federal court addressed the USPAP confidentiality issue in U.S. v. 2,091.712 Acres of Land, Case No. 4:09-CV-88-BO, E.D. North Carolina (2010). This is one of the very few other published decisions addressing USPAP’s confidentiality rule and was cited by the FDIC in its motion. 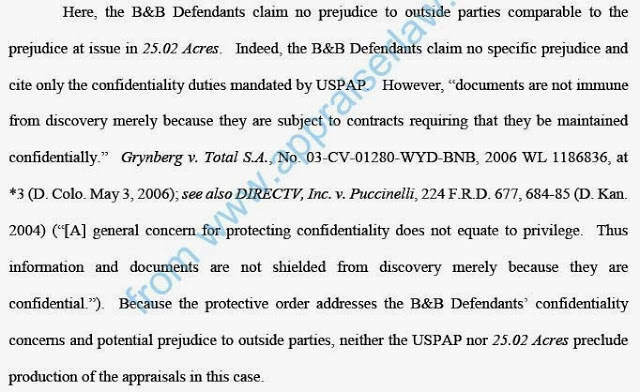 Similar to the facts in the 1974 pre-USPAP case cited by defendant Broom, in 2,091.712 Acres, an expert witness appraiser in a condemnation case was subpoenaed to produce appraisals he had performed of properties similar to the subject property. The subpoenaed appraiser objected on the basis of USPAP’s confidentiality rule. Like the court in Colorado, the federal court observed that “[t]he law does not afford an evidentiary privilege to professional appraisers” and further “the USPAP rules themselves explicitly contemplate the production of such documents to ‘third parties as may be authorized by due process of law.’” That court, too, ordered that the appraisals be produced. FDIC Complaint, FDIC v. Broom, et al., 12-3-12. FDIC Motion to Compel, FDIC v. Broom, et al., 8-5-13. Order on Motion to Compel, FDIC v. Broom, et al., 9-5-13. The defendant appraisers in this case and in other cases discussed on the Appraiser Law Blog are not insured by LIA Administrators & Insurance Services. LIA does not publicly discuss cases involving appraisers who have E&O insurance with LIA. All cases discussed on the Appraiser Law Blog are matters of public record. Its interesting and a good reminder to all of us, though it left the big questions unanswered: (1) Did either defendant appraiser over value the property? (2) How incompetent was the E&O insurer’s attorney to cite a pre USPAP case; which was also irrelevant to the point anyway? (3) Did the E&O insurer’s attorney cross complain against FDIC AND the original loan brokers; loan officers and borrowers? (4) Did the attorneys for either side order a forensic appraisal to determine just what the value was on the effective date? Did either side do an appraisal review? While it is possible one appraiser colluded with the loan broker to duplicate the other appraisers result; after first conspiring with the first appraiser to over value the property; it is also possible that $1.9 million was the natural and most probable rounded number for ANY appraiser to have reconciled to.